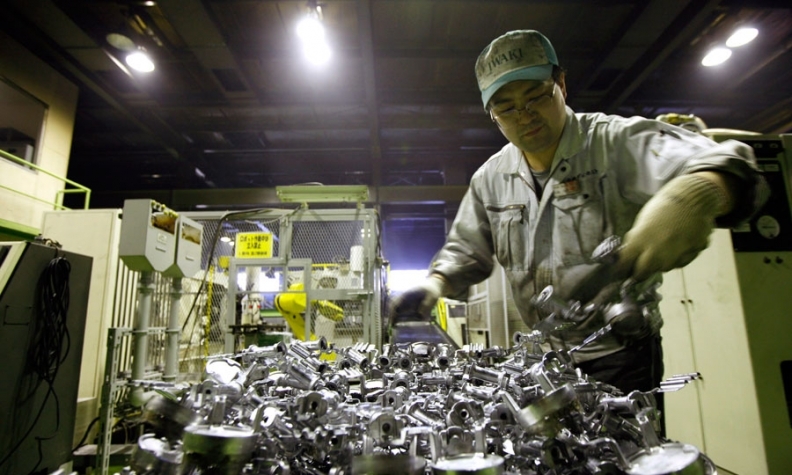 Power cuts following the Japan earthquake and tsunami turned aluminum at an Iwaki factory into lumps of unusable metal. TOKYO -- Iwaki Diecast Co.'s 15 electric furnaces shut down as the March 11 earthquake knocked out power, turning 12 tons of aluminum bubbling at 670 degrees Celsius into solid lumps of unusable metal. The supplier to Toyota Motor Corp. lost 440 pounds (200kg) of spilled aluminum and a magnesium die-cast plant washed away by the tsunami that followed in Yamamoto, Miyagi prefecture. Diesel generators were brought in to restore power and it took four days to melt the blocks so parts production could resume on March 22, Managing Director Hiroto Yokoyama said. "We are almost back to where we were before the earthquake," Yokoyama said in an interview at the factory. "But the big question is: What will happen this summer?" A power shortage threatens to hamper the northern Tohoku region's economic recovery following the magnitude-9 earthquake and tsunami on March 11, which led to damages worth as much as 25 trillion yen ($299 billion). Japan faces possible blackouts in the coming months after the quake and tsunami reduced national power generating capacity by 8 percent. The combined capacity of nuclear, oil and coal-fired generators, including the Fukushima Dai-Ichi station, halted after March 11 totaled 22,422.6 megawatts, according to a Bloomberg calculation based on statements from Tokyo Electric Power Co. and Tohoku Electric Power Co., which supplies power in the northern region. Tokyo and eight nearby prefectures may have a shortage of 15,000 megawatts should temperatures this summer approach last year's level, according to Prime Minister Naoto Kan's government. The government may restrict power supply to large users by as much as 25 percent this summer and to households by up to 20 percent, it said last week. Electricity shortages raise costs for manufacturers like Iwaki Diecast who are forced to pay for alternative sources. Diesel generators cost the company 400,000 yen a day ($4,800) for 3,000 liters of gasoline, Yokoyama said. Toyota has bought wheels for gear torque convertors from Iwaki since 2008 and when production failed, the carmaker increased orders from another supplier in Toyoma prefecture, said Kozo Sakurai, managing director at Toyota Motor Tohoku Corp. in Miyagi. Toyota Tohoku, which produces the torque convertors for the Camry, Corolla and other models, is also concerned about power shortages, Sakurai said. The company may start a 3 p.m. production shift at a later time to avoid peak demand, he said. "And of course, administrative staff won't be able to use air-conditioning," Sakurai said in an interview at the factory. Carmakers may also cooperate through a rotating production schedule to save power, Toyota has said. The Japan Automobile Manufacturers Association, the industry's primary trade group, is expected to coordinate measures. "The possibility of blackouts or limits to production has me extremely worried," said Miyagi prefecture Governor Yoshihiro Murai at his office in Sendai. "It would be very damaging for the manufacturing sector." Production at Toyota Tohoku will be at 40 percent of capacity through at least the end of the month, as dictated by Toyota, Sakurai said. Toyota has said it lost 260,000 units of production from March 14 through April 8 after closing 18 factories, citing a shortage of electronic parts, rubber and plastics. Cuts in production from limited parts and power supply may cut Toyota's operating profit by 200 billion yen in the current fiscal year, said Koji Endo, an auto analyst at Advanced Research Japan. For Northeast Japan, the electricity shortage may be eased by a thermal plant restarting in Niigata prefecture in early June and a new plant in Niigata that will start in July, said Sota Notsu, a spokesman for Tohoku Electric in Sendai, the capital of Miyagi. A nuclear power plant in Aomori prefecture, which suffered no damage from the earthquake and has not been operating, would ease shortages, Governor Murai said. The Higashi Dori nuclear plant shut down on Feb. 6 for routine inspection, Notsu said. The plant was scheduled to restart in July, a plan likely to be delayed as it considers safety issues and any changes in the central government's nuclear energy policy, he said. Japan's Nuclear and Industrial Safety Agency raised the severity rating of its nuclear crisis to 7, the highest level, matching the 1986 Chernobyl disaster, after increasing radiation from the Fukushima Dai-Ichi plant prompted the government to widen the evacuation zone. "It's easy to become hysterical and say nuclear energy is bad," Murai said. "But we need to think about this calmly and rationally."